“Coyote Lovely” doesn’t have the strongest story in the world—something it manages to get around by trying out an unusual storytelling structure for about two-thirds of its running time—but man is it funny. I think I might have laughed at this episode more than any other this season (possible exception of “Legs”), and that counts for a lot. Yeah, yeah, it’s a little predictable that Archer would be felled by a beautiful woman who also works as a coyote, ferrying illegal immigrants across the Mexican/American border, and the ending continues to emphasize how this season seems to be misusing Malory in some really weird ways. But for the most part, this is a long bunch of great laughs, with every character getting at least one hilarious moment. (Pam and Cheryl, the season’s two most consistent characters, are barely in this one, but that doesn’t really matter, because Pam gets an amazing flashback to when she seduced a Mexican man on her dairy farm.) And it features a shot of Archer getting fixed up by an unlicensed veterinarian while the immigrants stand around him holding cats and dogs. How can you go wrong with that? First of all, isn’t it a bit surprising just how often Archer has seemed as if he might die this season, only to survive his potentially lethal wounds without any further thought? Tonight, it comes when he takes the bullets in the back while trying to shield Moreno—the aforementioned beautiful coyote (voiced by Carla Jimenez)—from the border patrol agents. This leads to his visit to the vet, along with him being tossed into the back of the immigrant-bearing station wagon to recuperate, and it seems like just the latest escalation in the show having fun with the idea that its main characters can’t die. In past seasons, this usually just resulted in the characters surviving a hail of gunfire while cutting down their enemies in a handful of shots. Now, it’s actually evolved into Archer’s mutant healing powers. “Coyote Lovely” is also, of all things, a weirdly detailed discussion of U.S. immigration policy at times, with Archer taking the point of view that the Mexicans crossing the border are just people in pursuit of better jobs, while Lana (whom Archer describes as a “Lorax-blowing tree hugger”) isn’t so excited with the thought of more people clogging up an already stuffed health-care system and not paying taxes. I mean, this isn’t Aaron Sorkin or anything, but it’s amusing to have something approaching an actual political discussion on Archer, even if it disappears for most of the rest of the episode. (It comes up again later on.) Nobody’s expecting Archer to take a position in either direction—outside of the fact that Lana’s usually the sensible one and Archer the raging jackass (and this is probably more a joke about how you’d never expect Archer to be the one expressing empathy for anyone other than himself)—but it’s still funny when these sorts of real-world issues pop up in the series’ odd pastiche of 50 years of American history. 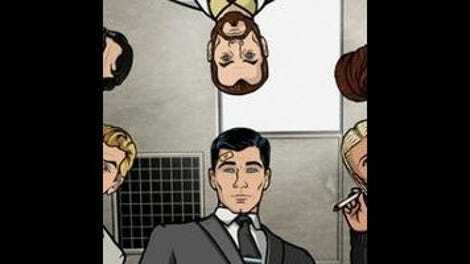 The episode starts out as Cyril and Lana telling Malory a story about how they came to have two black eyes and a broken nose, respectively—would you believe it involves Archer hitting both of them?—but it mostly does that to catch everything up to where the story is as we reach the end of the first act to catch up to Archer driving Moreno and the illegal immigrants around Texas in his station wagon. At first, I was a little disappointed that this storytelling device didn’t play out throughout the episode, but once the episode settles into the question of what’s actually going on with Moreno, it gets onto the rails again. Every season seems to have an episode like this, where some sort of larger mystery ultimately implicates Malory—who just wanted a hefty payday here and set Archer up that she might collect the money and redo her office—and they’re usually among the best episodes of whatever season they’re in. What’s more, the show doesn’t go to this well so often that it loses its potency. Once or twice per season seems to work just about right. The twist at the end that everybody’s after the younger Moreno’s mother doesn’t really work—since you’d figure either Cyril or Lana would have done a little research, regardless of what Malory told them—but hell, that’s only a small quibble. The episode was also filled with great voice actors. I’ve already mentioned Jimenez, but Nick Searcy of Justified turns up as a rather incompetent border patrol agent, and Dayton Callie of Deadwood and Sons Of Anarchy turns up as the aforementioned veterinarian. Callie, in particular, is a lot of fun as the guy who patches Archer up but doesn’t quite know what he’s doing. There are also some great visual gags in this episode. Archer is a show that looks gorgeous in and of itself, but it seems to have gotten even better looking this season. It’s also more confident with visual humor, as when the border patrol agents drive past the car Archer’s driving and see all of the people crammed into it, or just the look of Cyril with the black eyes, which makes him look like a puffed up Archer. (The look of Cyril when he takes off his shirt is also very funny.) Every shot of the back of the station wagon once Archer and the border patrol agents are laying down in it is also terrific. And, hell, if that wasn’t enough, this episode had some solid jokes in Spanish, courtesy of Lupe, an unusually violent old Mexican woman whom Archer… befriends, I guess you’d say. Mostly, though, this is just an episode filled with lots and lots of amazing jokes. What’s more, not as many of them play off of older gags as has happened in some episodes this season. Archer’s tinnitus comes up again, but there’s also a great payoff to the constant string of long voicemail greetings Archer’s used to confuse his mother all these years, as she simply ignores his pleas for help and a Medivac chopper because she thinks he’s trying to trick her again. 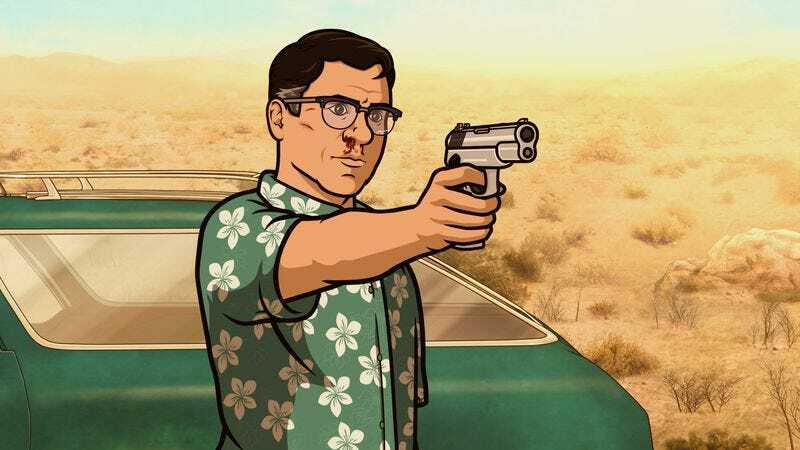 I didn’t laugh as much at the first handful of Archer episodes this season as I usually do, even if I liked Ron Cadillac a lot more than most of you seemed to. But these last two episodes have me thinking the season is back on the (admittedly impossible to match) track that made season three so great. Here’s hoping the season closes out in similar fashion. Was Archer’s ringtone a piece of music I should have recognized? I’m terrible with those noticing those sorts of things. Malory’s not sure she should get all white carpet, given everything that goes on at ISIS. I have to say I agree. To hell with normal protocol! Let’s just run some quotes! “I can do this all day, since I find repetitive behavior so calming!” Huh. Maybe Archer really is on some weird, undiscovered corner of the autistic spectrum. “What’s cereal made from? !” Cheryl finally learns that milk comes from Mexicans. “Ha ha. She slapped you so hard you died.” I wish an omniscient Krieger voice taunted all of us. “Since when is babysitting Archer my… oh my God, that’s exactly my job.” Lana finally realizes what her exact job description is. “You get, like, six freebies.” I don’t even remember who said this one, but it was great! “Thanks to one petty local politician… and one petty barn full of dead horses.” Here, Dayton Callie steps up and reminds us why he is one of our finest actors. “I’m just a hologram.” Krieger also provides us with the ultimate excuse for getting out of a jam.